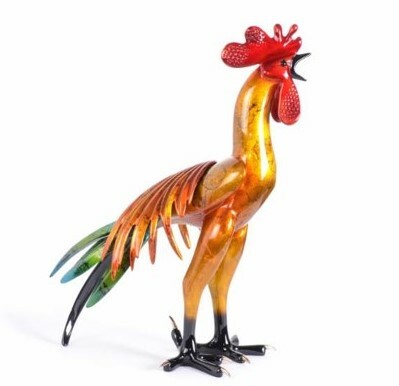 Confident and flamboyant, Tim Cotterill’s splendid new bronze sculpture clearly exhibits these classic traits of a rooster. The iridescent blue-green tail, accentuated by the copper toned saddle feathers, transitions to a burnished gold body with a brilliant red comb as the crowning touch to this vibrant patina. Available in 4 weeks time. This entry was posted in Bird Sculptures and tagged tim cotterill by Bronze Frogs. Bookmark the permalink.